Oh Yeah! Praia da Rocha in Algarve, Portugal. Of course the scenic beach voted Best Beach in Europe is the place of BeachTravels spring camp 2019, April 27th to May 11th. The success has been growing for years and literally exploded last year. So next year we’ll be back bigger and better than ever. We are ready to WELCOME everyone in the big beach family! Everybody is right for this unique camp – the newcomer, the family, the singles, the friends, the groups, the indoor players – anyone of any nationality that’s looking for a unique exciting beach volleyball experience. Can’t wait to see you there on our 38 courts!!! Kick start the new season with world class training and enjoy the most beautiful beach of Europe whilst staying in our 5 star hotel! Like always BeachTravels is striving for real top quality and together with this year’s updates and news we are reaching for new heights. 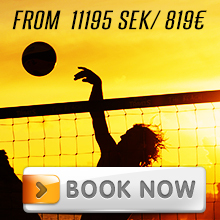 Don’t miss out on the coolest beachvolley experience of the year, where we make you a better volleyball player and you will have an unforgettable time, says Rasmus Jonsson. 4 FREE yoga classes for all participants. Start your day with a sunrise yoga class on Europe’s most beautiful beach or try our new relaxing evening Yoga sessions. Beach Yoga is an energizing workout that reduces stress and brings a flexible you to the court. We now offer a choice of staying at the 5 star hotel or a simple functional apartments (kitchenette included) a 15 minute walk along the beach from the courts. Spontaneous Tournaments every day! Our tournament concept is growing, various competitions will be held each afternoon for those that can’t get enough! This is the perfect opportunity to play against new opponents and challenge your competitive drive while getting to know lots of new people! The week will of course be topped off with our Big End of the week tournament – Beach Travel’s Trophy! The surf trip – one afternoon road trip. The waves decide where we go in Algarve. Included is the journey, about 2 hours surf lesson with instructor, board, wetsuit and insurance. Your instructors will be led by one of the world’s most well-known technical coaches, volleyball legend Anders Kristiansson, together with Mattias Magnusson and Rasmus Jonsson. All of them national team coaches. We are also working to continually educate and update our coaching staff throughout the year, as well as before and during our camps. Anders has spend considerable time observing, assisting and helping the coaches during the training sessions. A support for the group, the coach and our concepts. Swedish Champion 2006, World Tour player 2000-2007 and CEO at Ledarskapscentrum. ”I was a total Beach Volley rookie when I joined BeachTravels last spring. It was the best vacation week I ever had. BeachTravels are real pro’s, I learned a lot and the atmosphere was incredible. Always exciting activities to engage in or great opportunities to chill and relax if that is want you want. I also got to know loads of new friends, can really recommend EVERYONE to join the camp! Free child care (2-12 years) during the morning training session has been highly appreciated and we are definitely repeating the concept this year. Be able to fully focus on your own training and then have some quality time with the kids on the gigantic playground that the beach actually is! We also have a children’s hangout area in connection to the dinner restaurant so parents can socialize with other camp participants after their children have finished their dinner. Praia da Rocha is located at the coast of Algarve and has perfectly white, powdery, soft and 100 % dirt free sand. The beach is 1.5 km long and 250 meters (!) wide. It is a charming Portuguese coastal town, which has tremendously beautiful sunsets and the beach is surrounded by dramatically sandstone cliffs. The accommodation is a stunning 5-star establishment called the Algarve Casino Hotel and is located right next to the beach. With its own access directly to the courts, it also features a large pool that you can use for recreation and relaxation while watching others train. The breakfast and dinner buffet is magnificent and the combination of high quality food paired with a spectacular view of the beach and ocean is nothing but magical. You will love the location and luxury! Pump it up with the best training ahead of the summer’s beach volleyball competitions as well as with cool awesome beach hang, the most luxurious hotel and the outstanding beautiful beach… Come along with BeachTravels to Praia da Rocha 2019!